Zero Dark Thirty: towering achievement. Zero Dark Thirty opened wide yesterday, and finally made it to Phoenix. This is the first time in years that I've wanted to see a film in theaters. It didn't disappoint. Kathryn Bigelow got screwed out of an Oscar nomination, ostensibly because three U.S. Senators slammed her for, among other things, the depiction of torture. But Bigelow doesn't endorse or condemn torture, and that ambiguity is one of the many things that makes this film great. Mark Boal certainly deserves his nomination, if only for writing a suspenseful film to which we already know the ending. Jessica Chastain is not really up to the heavy demands the script places on her, and I believe she stole her Oscar nom from the film's Jennifer Ehle (EE-lee). But that's just quibbling. Highly recommended. 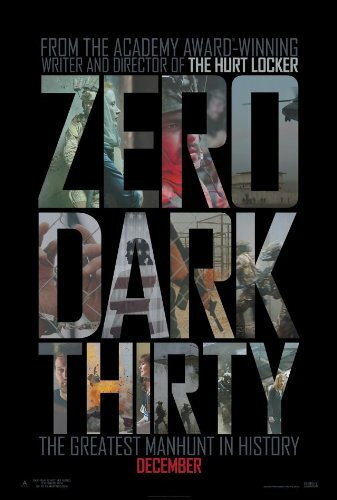 LATER: Critics of Zero Dark Thirty say the torture scenes suggest America never would have found Osama without torturing detainees. But Bigelow+Boal's towering achievement is forcing us to face the reprehensible moral choices that led the Bush administration to use torture, while clearly showing us that the key to finding Osama's courier (and thus, Osama) had been submitted by another country's intelligence service shortly after 9/11, but had gone overlooked in the CIA's files. If Bigelow+Boal had left out the torture scenes (which imply much suffering, without making the audience suffer equally), the film would have been dismissed as grossly inaccurate. The most memorable line in the movie is Dan's warning to Maya: "You gotta be real careful with the detainees now. Politics are changing and you don't want to be the last one holding the dog collar when the oversight committee comes." For I am here, I am here. I went over the Fiscal Cliff years ago.